So MiniSquadron SE has been out for a few days now - massive reaction to it, currently it sits at #11 in both Arcade and Action charts in the USA!! Strangely - it's not getting a look in the UK, but I think that's due to the fact I haven't updated MiniSquadron 1 to let people know about it, and also because it hasn't been featured yet (unlike in the US). I want to actually write down a whole bunch of links to the press that MiniSquadron SE has received, but in particular I've appeared in articles in Edge - which is really fun! Check em out! 1) My friend (also in the UK) has an account with SkyFire, and for some bizarre reason he can stream the video to his Windows Mobile Phone (with sound). 4) I then watched the video through god knows how many links of disassociation! 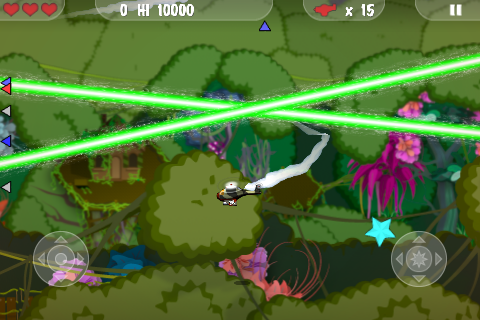 MiniSquadron Special Edition has been submitted to the App Store in all its glory! If everything holds up then it'll be done when it's done - it's out of my hands now! 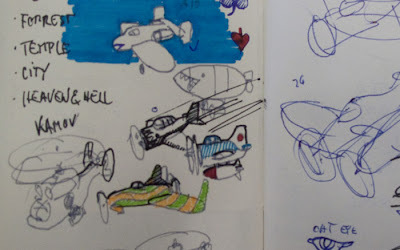 Just a quick post to show a sketch done by Nils on some rough paper when I was talking to him about the levels and planes in the game. I love silly sketches - especially the blimp thing with a shark face! I'd also thought I would post a bit more information regarding price and other things that exist in my brain. 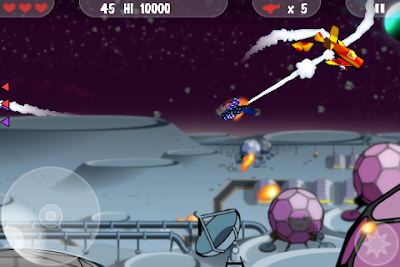 - 2 new pickups: "Rapid Fire" and "Freeze"
- A new weapon - Fireballs! 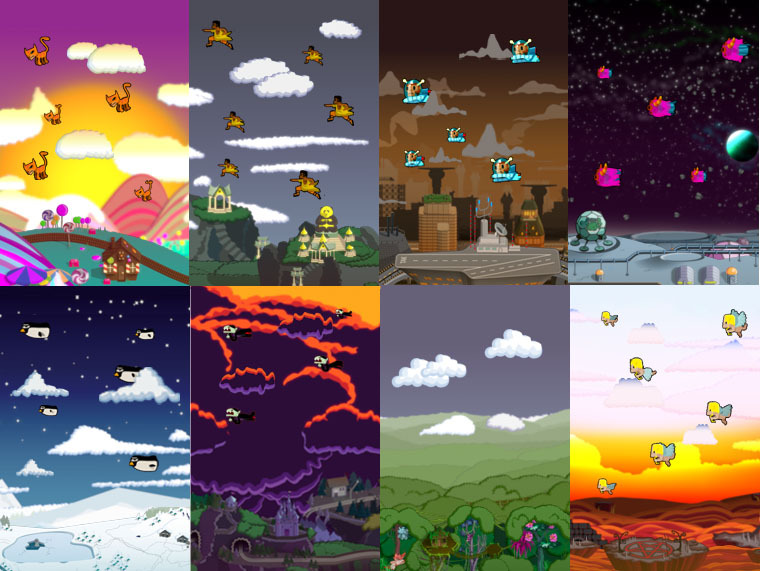 - More animals to shoot down - including Jellyfish, Vampires and Hamsters! So there's just as much gameplay in this version again, and hopefully will satisfy fan's hunger for more things to shoot down (come on guys - HAMSTERS!). The inclusion of helicopters changes things up again -you can get them to hover in midair, but they can only shoot left or right. Multiplayer sessions just got a bit more amusing! I should add here that the background art was done by Nils Porrmann this time round - and you should go and check out his website for more of his other work here. 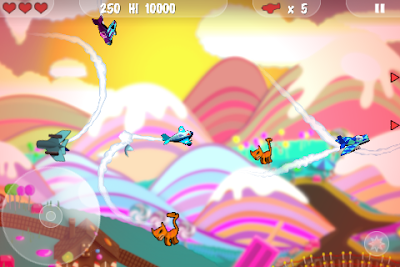 The crazy animals that you can shoot down are drawn by the one and only Rex Crowle. When you shoot them, you can hear the squeaky voice of Whitney Hills - whos another Indie making a mad game called Ghost Chef! What is going on with the Price man? MiniSquadron Special Edition will be available to download, and have 2 levels to play for FREE. You can then unlock 2 levels at a time for $0.99/£0.59. This way, you can try the game before deciding to go for more, or buy the extra levels at your leisure. Don't forget YOU ARE GETTING 2 LEVELS THAT YOU CAN TRY OUT FOR NOTHING! Everyone can try it out! When's it out FungFung? The game is currently missing exactly 3 sprites. Yes, that's right and once they're in I should be set to submit. This is likely to be 2 or 3 weeks time, so expect some preview builds in the press before it goes to Apple! Following Fox Vs Duck, I really want to give back to the fans of MiniSquadron, and that is also why I wanted to give some content away as a sign of thanks for the great support I've had. MiniSquadron fans really showed they cared and after meeting some at GDC I really hope you guys will enjoy the madness that is in Special Edition! I leave you with some screenshots of the game, and please leave a comment if you like what you see! (^ 3 ~) (I missed my asian emoticons). Whoops - seems like I only now have time to write a quick post here. I haven't ran away, it's just that as more work is coming up the less time I have to actually write about the work, doh! Back from GDC a week ago now, was very happy to see lots of love for MiniSquadron and Fox Vs Duck. Big up Jon and Alex from PocketGamer - lovely guys, and also great meeting with Jeff Scott from 148apps. There were also many other people I ran around and met but too many to list here - I should mention Jason Citron and Eros Remininininini (of OpenFeint) as they were pretty fun, just a shame I couldn't hang too long. (Jason has really big hair - it rocks). If I met you or missed you (sorry Keith from Imangi!! and sorry Trevor from AppAdvice!) leave a comment in the blogs and let me pretend I'm still in San Francisco with the crazies! At GDC itself loads of great lectures and people. Big takeaways were in-app monetisation and "social gaming" in the wider sense of the word. 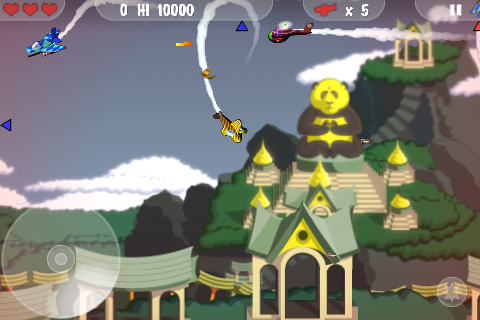 Check out Gowalla and PackRat, social games with real world consequences, that's what really piqued my interest. Also related would be CCP's Eve Online - their talk on the crazy metagames played by people in the real world was both hilarious and exciting. And no piece about GDC is complete without a mention to Uncharted 2! So some new NEWS!! Fox Vs Duck has been out for a while, peaking at a superb position of 14 in Top 25 Paid Apps in UK - mostly down to it being featured in the front page by Apple. Nowhere is it to be seen in the USA though - which is kinda sad. I'll be doing some updates over time for fun as it's such a nice little game, so let's see how dark I can make it as I update..hehe! Fox Vs Duck! New Game Alert! Finally, I can update my blog! 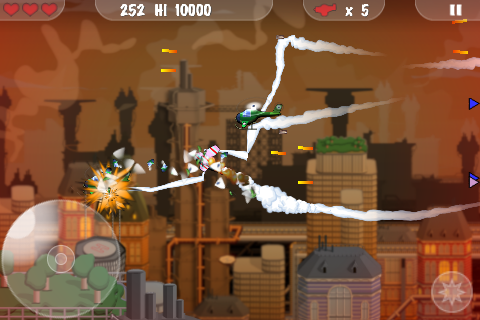 The reason I've been away was I was busy finishing off a brand new game called Fox Vs Duck! So far, the only thing revealed about it is a teaser trailer (see it here www.FoxVsDuck.com), although the game is now in submission at Apple so it will be revealed pretty soon what its all about. Currently also moshing a gameplay video together to show how to play it! On top of that, Artist Dave then went on to write an automated script to type things into the text box - so it "chats" to random people about Foxes and Ducks. We then left this on and let it do its evil work! 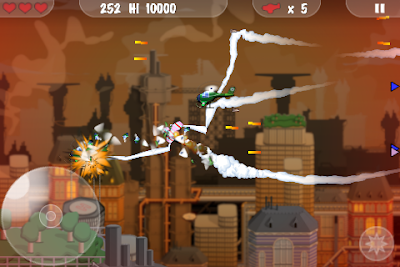 MiniSquadron is a frantic shooter on the iPhone, involving lots of little planes all vying for supremacy of the skies! Simple and highly addictive old-skool shooting gameplay suitable for all ages, with stunning graphics to match! Take your Mini Squadron through lush forest levels to modern cityscapes, and then SHOOT EVERYTHING IN THE WAY FOR A HI-SCORE! 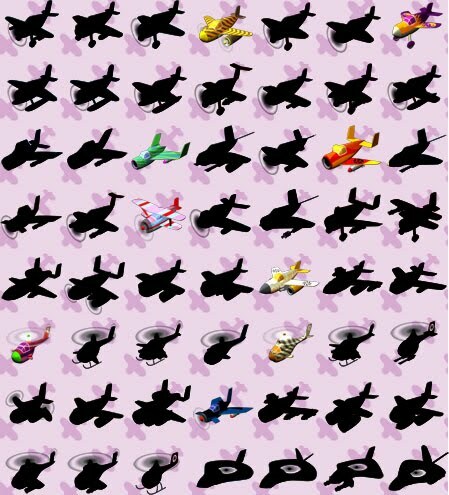 Shoot down enemy planes, bombers, UFOs, ducks, collect a plethora of power-ups - and unlock over 50 types of planes with different weapon types! There's nothing quite like this on the iPhone, BUY IT NOW! Then make your friends buy it and BEAT THEM IN WIFI MULTIPLAYER!